Bridging AZ Furniture Bank began as a vision turned reality after Jim Piscopo, an Air Force Veteran and licensed contractor at the time, recognized an essential need while doing volunteer work with two Phoenix-area domestic violence shelters. In 2003 Jim realized families transitioning from a shelter into a home of their own had little or no resources available to help with basic furniture for their newfound home. Most of the individuals and families have become economically disadvantaged, some from life-transition trauma, possibly as a result of domestic violence, substance abuse, learning disabilities, loss of a spouse, lack of job training or just hard times. After seeing the need first hand, Jim and his wife Donna (above) felt a ministry call and took it further than most people would have imagined. 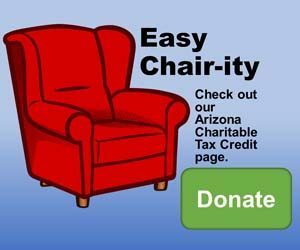 In 2004, they gave up their jobs and downsized their home to provide the initial funding to start Bridging AZ Furniture Bank as a ministry of St. Barnabas on the Desert Episcopal Church featured in the 2005 Camelback Magazine Philanthropy section. Their ministry and community outreach, now a 501(c)(3) nonprofit, collects new and gently used furniture and distributes it to qualified, agency-sponsored families and individuals in need. In their hearts, Bridging is still a faith-based ministry designed to help create healthy families and home environments where each family member may flourish—mind, body and spirit. Through generous donations from the community, Bridging AZ has distributed over 250,000 donated items valued at over $6,000,000 to families in need in the past eight years. Bridging receives No Government funding. Today, volunteers help as Bridging AZ Furniture Bank remains Arizona’s only Nonprofit Furniture Bank and they have proviede furniture and household items to clients of over 200 social service programs, here is a short list.